A new member of the Ceed family has been teased in a new design sketch. Hyundai may be skipping this year’s Geneva Motor Show, but its sister brand Kia will be bringing a brand-new model to the show. Last year, the Korean automaker revealed the new Ceed hatchback at the Swiss auto show. One year later, Kia is preparing to introduce a new member of the Ceed family at the 2019 Geneva Motor Show. According to a report published by L’Automobile Magazine, the new model will be a compact crossover based on the Ceed that will slot below the Sportage. Just when you thought Kia’s crossover line-up couldn’t get any more convoluted. So far, the Xceed has only been shown in a design sketch posted by the French publication with an exaggerated design featuring massive wheels, a sleek profile, and a coupe-style sloping roofline. It looks pleasingly sporty, but we’re expecting the production model to be toned down. In Europe, the new Ceed-based crossover is expected to be offered with 1.0- and 1.4-liter turbocharged gasoline engines and a 1.6-liter diesel, as well as a plug-in hybrid powertrain. According to rumors, the latter could have a combined output of 204 horsepower. It will also feature a digital 12.3-inch instrument cluster that will also be introduced in other Ceed models in the fall. If the report is true, the new Kia Ceed crossover should debut on March 5. Since the Ceed isn’t sold in America, it’s unlikely the new crossover variant will be available in the US. However, Kia is preparing a new compact crossover specifically for the US and Indian markets that will reportedly be called the Tusker. The model was previewed last year by the SP Soul Concept and is expected to offer either a 1.4-liter turbocharged gas engine or a 2.0-liter naturally aspirated unit mated to a seven-speed dual-clutch automatic. 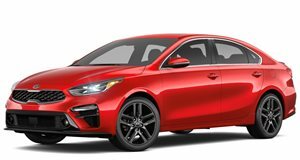 The Kia Forte isn’t a bad car, but is unremarkable in comparison with rivals. Doing at the bottom what the K900 did at the top - adding value.